Our thanks to the newspaper for giving us permission to share this article with you. 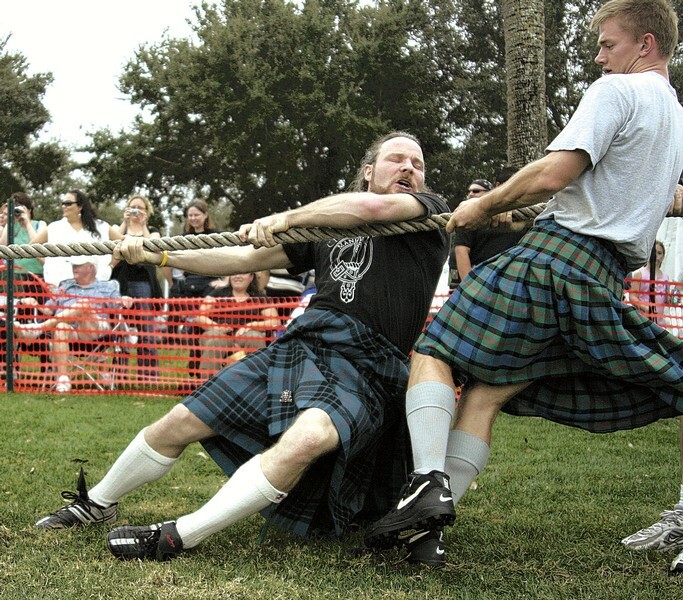 FESTIVE FIGHT: Engulfed in a battle of strength and will, veteran athlete Ching McKee, center, pulls a rope in the tug-of-war event at the 29th Annual Central Florida Highland Games on Saturday. The Winter Springs event brought athletes from across the country. Shrouded in legend and born in a time where survival meant finding whatever weapons a man could, the Scottish Highland Games are a cultural enigma in the world of amateur sports. Tossing logs, throwing bags of rope and hurling chained iron into the air, a growing group of athletes is transforming a historical footnote into a world class sport. Crouching near the ground, a huge man in a kilt wrapped his hands around a dead tree trunk as his eyes panned upward and forward. His gaze fixed, his face jerked tight with anticipation of what he was about to do as he visualized 140 pounds of wood flying through the air. He was taking a trip into a sporting past that used to be deadly serious. Nine hundred years ago, warriors 3,000 miles away would stand trees on end, lift them into the air and try to kill as many men as they could with them. Scotland was constantly at war. Their swords, arrows and clubs taken by the British to prevent an uprising that wouldn't be stopped, these were their weapons. The biggest and strongest men in the country were gathered to stop an invasion. They used trees, weights attached to chains and rocks to test who would lead the fight. When they made it to the battlefield, they dragged some of those crudely fashioned weapons toward their enemies, cocked and fired. At least that's one theory of the origins of the games, passed down through the ages and now spilling out the mouth of John Stenard as he watched from the sidelines of the 29th annual Central Florida Scottish Highland Games Saturday. At Winter Springs' Central Winds Park, more than 10,000 spectators got a taste of what they had been missing from their family trees. "There's a lot of theory about how these events originated," Stenard said. "Especially the caber toss. Nobody knows for sure." A few parts "Braveheart," a pinch of survival instinct and a bit of competitive spirit were playing out in front of him in a sport few outside Scotland get to see, but what's slowly but surely becoming a national sporting phenomenon. Scottish Highland Games have been around for centuries, but only recently spread to America, where immigrants hundreds of years ago sowed the seeds of Scottish heritage. The objects of the modern games are simple: Throw a weight the farthest, the highest or the straightest. What the athletes throw is where it gets weird. There are no shots to put, no discuses to whirl around and no javelins to launch arrow-straight. They pick up small boulders and hurl them from their shoulders. They pick up logs, called cabers, and try to flip them over in the air. They grab a weight with a chain attached and launch it over their heads. On the verge of an explosion in popularity, the sport that was once maligned as a nostalgic laugh is getting serious. "A lot of people poo-poo the games as people running around in kilts," Stenard said in a chipper Northern accent. "But this is a tough sport." That's not a difficult thing to believe coming from a man who broke his back at a competition more than a decade ago. Now retirement age after dominating the esoteric hodge-podge of events for years, he's out of the game for good. As a field judge on the sidelines, he's watching his sport grow. Since giving up the sport, he's seen it shoot up by leaps and bounds, propelled on the feet of some of the best athletes in the country. Just before last year's games Jason Richards won the Central Florida Highland Games and represented the United States against Scotland in the world championships. The United States won. This year he didn't show. "He's training to be a decathlete," said friend and teammate Kevin Dupuis. "He wants to be in the Olympics." In his early 30s, Dupuis is one of the younger athletes in the sport at the moment, but says that age is shrinking as the level of competition ratchets ever higher. "Most guys are in their late 20s or early 30s when then find this sport," he said. "A lot of them used to be track athletes in high school. Some of them go on to be track athletes after this." The sport that once pulled only avid Scotsmen looking for a history fix is now pulling some of the brightest stars in college athletics. His words are plain, tinged with a hint of intimidation. The young guys are coming, and the average age of Highland Gamesmen is moving southbound. Last year Dupuis was second place at a hotly contested Central Florida games. This year he was unsure if he'd be in the top three. Striding out with big, long steps toward a pitchfork stuck in the ground, he smartly whips it up, digs the tines into a burlap bag filled with rope, turns his head to look up and launches it toward the clouds. Up, over the bar, down. Success, but maybe not enough to win the day. Dupuis doesn't look like a guy who fears other men. At 6-feet, 6-inches tall and weighing 295 pounds, he's intimidation personified. Hoisting his body skyward are calves the size of the next biggest man's thighs. They hide underneath knitted knee-length white "kilt socks" with small tartan tassles to tell you he's Scottish - at least a little bit. Just to confuse people, he's wearing a "Vote For Pedro" shirt today. Strange clothes or not, he's not the type of man you would argue with on a street corner. He's also not the strongest man at the games, and he knows it. Looking over his shoulder from under a tent at the side of the field, he spots a shaved head and a yellow skin-tight shirt a hundred yards away. "Lannie can beat me in any lift in the gym," he said, pointing to former Natural Athlete Strength Association world champion Lannie Pullon, the man he expected to lose to. "He's a lot stronger than I am." That's something Mark Howe knows all too well. A quick look around reminds him of a tough reality - he's the smallest competitor on the field. Last year was no different - nor the year before. DuPuis towers over him by nine inches. Most of the rest of the competition has nearly half a foot on him. At 34 years old, he's not getting any taller. He also knows he can beat almost everybody he sees. "A lot of what you need is technique," he said. "You can be the biggest and strongest guy out here and still not do well." His job is to pull off the seemingly impossible - embarrassing men who sometimes dwarf him by 100 pounds or more. "Oh yeah, the big guys hate it when I beat them," he said. "I used to get that all the time." Now in his ninth year of competition, he's well known as a competitor to watch out for. His secret, like many at the games, is in his past. An Olympic weightlifter before finding his Scottish roots, he built a base of strength in events that sometimes resembled the movements he had use in the overhead throwing events, which comprise half the games he plays today. Just as he's warming up for a toss, the crowd erupts behind him. For the first time, and perhaps the only time today, a lady has done the improbable: turned a caber. One of only a handful of ladies competing in the women's class, Suzanne Burgess is only just over five feet tall, but just tossed a log more than twice her height and flipped it completely on its end. "It takes a lot of skill to do this," she said. "Sometimes it's just luck." She's a rarity at the games, but a sign of better things to come, encouraging more women to try the games with each success she has on the field. Turning back to the metal chain in his hand, Howe, in all black, is stone faced, a picture of concentration. Swinging his torso up and down a few times, he revs up for the final yank. He has 56 pounds in his hand and 10 feet of air above his head before the bar. In a quick jerk, it flies up inches in front of the bar, curls over it by centimeters, and trails just behind on its way down, equaling what the bigger athletes had barely been able to accomplish. His training had paid off. Lifting weights to get to this point was serious business, he said, but this is even tougher. "I practice more for this than I did for lifting," he said. "I used to train three or four days a week two to three hours a day." Accent on the words "used to." Like many of his competitors, he's playing through pain. Favoring his left arm today isn't an option, though he wishes it was. Most of the lifts and throws in the games are one arm only. Like most of his competitors, he's been throwing with the same arm for years. Now his right throwing arm is wrapped tightly in a flesh colored strap to keep his elbow from falling apart in the middle of a toss. Disguising pins underneath it that were inserted into his elbow to keep it stable, the wrap does little to ease the pain brought on by nearly a decade in a punishing sport. More than half of the 13 athletes on the field have braces on both of their knees. Some have them on both elbows - the consequence of the quick movements and brutal force of the throws and flips that tear their joints to pieces. Howe is full of injury stories that would make your stomach turn. "One guy last year finished a competition and his shoulder was red, black and blue," he said. "So he went to the hospital the next day to get it checked out. The doctors told him he had torn every tendon from his shoulder muscle. They had to surgically reattach them all. Seven months later he was already doing other games." Howe only wishes he could be back that quickly. "When I first started this when I was 25, I'd get hurt and come back the next week. Now if I get injured, I come back next year." As the weight curls smoothly just a breath away from the bar, his arms shoot into the air in triumph - steel pins and all. DuPuis, Howe and Pullon had a new guy to deal with this year on the American Highland Games Circuit, but they had seen him before. Frasier Ewing was part of the Scottish national team that lost to the United States in 2004. Unable to wait for a chance at revenge, Ewing got married, left his native country in September at age 25 and came to the United States. "I only came here because my wife agreed that I could keep playing in the games," he said through a thick Scottish accent. Settling in Oviedo was a great choice, he said. "In Scotland, I could only practice for maybe three months," he said. "Here I can practice and compete year round." DuPuis, Howe and Pullon will likely be seeing a lot more of Ewing in the next few years. They all know each other already. It's a growing community that's bringing together competitors, unlike most other sports. "We're all friends here," Pullon said. "I e-mail [DuPuis] three or four times a week. I've got guys here on my speed dial. I've got more out-of-state numbers in my cell phone than in-state." Those four men are rarities in their games. They can afford to travel the country to compete. That's something few can do. The main reason, money, holds most back. "Only the world champion at this can really make money doing it," DuPuis, a software developer, said. "The rest of us probably lose money." So why do they do it? With little in the way of available income and crippling injuries waiting at the end of their career, what's left? Howe calls it a love of the games. "It's an adrenaline thing," he said. "You get out there and turn a caber and the crowd goes crazy. That really gets you going." Pullon, whose throws had edged the others in nearly every event, was called to the stage as the sun set over the trees. He was the only competitor in his class who would be recognized today. No points for second place. His prize - a handmade sword straight from Scotland - sent a smile shooting across his face. He had just flown in for the competition from Indiana. The next day he would fly back to his family. Today, he was a champion. "Days like this, when the crowd just gets behind you and you have a good day, that makes it worth it," he said.